3 tsp bread machine yeast or quick-acting active dry yeast. 1. Place all dough ingredients in bread pan in the order listed. 2. Choose the dough cycle and press start. 3. Grease a cookie sheet. Divide dough into 15 pieces. Shape each piece into a ball. Place 2 inches apart on cookie sheet. Brush with melted butter. Cover; let rise 30-40 minutes or until double. 4. Head oven to 375. Bake 12-15 minutes or until golden brown. Your own rolls – can be the ones above (amazingly yummy) or even store bought refrigerator rolls. We tried this earlier this week and loved it. I just wanted to let you know that I am passing on the One Lovely Blog Award to you. You can get more info at http://craftymomsshare.blogspot.com/2012/04/getting-ready-for-easter-and-award.html. Thanks so much for thinking of me for the One Lovely Blog. Hope you had a great Easter. Great recipe. I will have to find a recipe that doesn’t use a bread machine. I don’t have one. I have always loved the idea of these rolls. 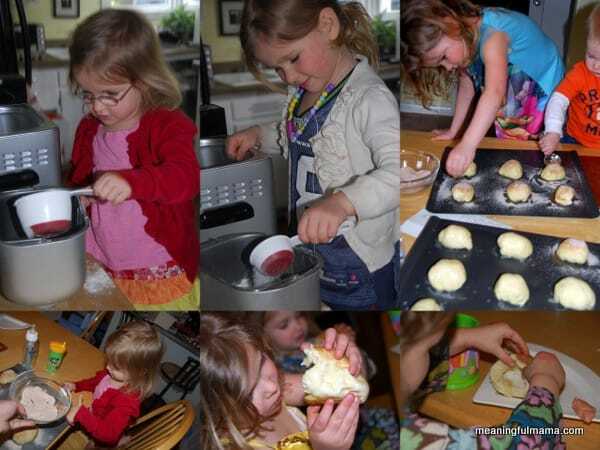 Loved the pics of the children baking. You have got it right, little Mama. Just keep loving them and being active with them. Thanks so much. I am praying every day that I’m getting it right and that God’s grace will handle the rest. I hope you had a wonderful Easter. Such a great idea and with so much meaning. Thank you for sharing at Sharing Saturday!! I hope you are having a great week!! These turned out wonderful! 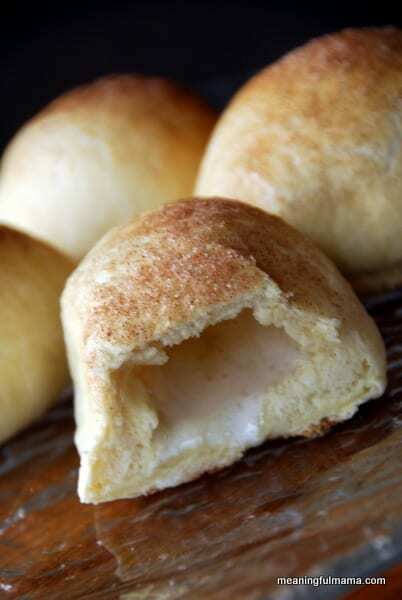 I was looking for homemade resurrection rolls, and these were perfect. The only change we made was dipping the marshmallow in the melted butter & cinnamon/sugar mix before wrapping it in the dough. Delicious!! I don’t who was more excited about the tomb being empty, me or the kids! Thank you for sharing! Such a great idea to dip the marshmallows in the butter and cinnamon & sugar mixture. You can’t go wrong with all that yumminess. I’m so glad to hear these worked out well for you. Thanks so much for commenting. I hope you had a great Easter. The first time we did this, the children were amazed. Now we do it every Easter in Sunday School. For those of you without a bread machine, it works very will with refrigerated biscuits. It’s also quick enough to do in Sunday School. Good tip! I am so glad this has become a tradition in your church. It’s a tradition for our family too. It’s such a great visual (and tasty) for the kids that can really make an impact. 🙂 Thank you for sharing.